This video was shot by "torgotom." In the background, one can see Christine West (the director of Lawndale), Alchemic Ale's Tim Leanse, and various members of Sketch Klubb. Speaking of Lawndale, they have an excellent Flickr page where you can see the entirety of Walpurgis Afternoon (and the other exhibits). However, these photos should merely motivate you to see the show in person--especially because they don't capture all the remarkable detail in Woodring and Bell's drawing. And speaking of Marc Bell, here is a photo of him at the Orange Show. 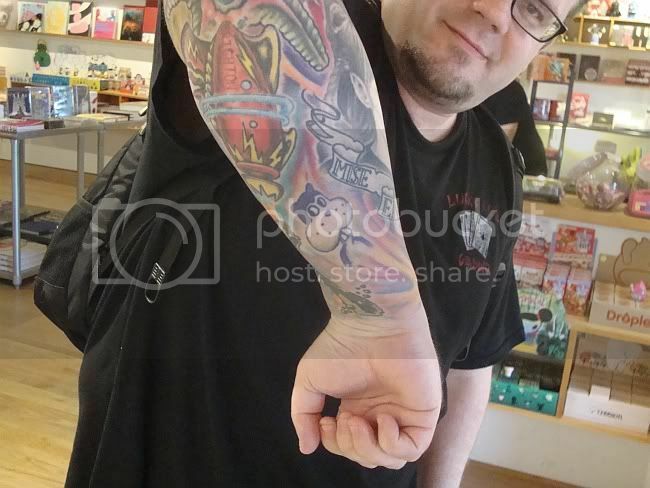 And finally, the ultimate tribute: a fan with Jim Woodring's character "Frank" tattooed on his arm.